Firstly thank you to everyone that participated in the 2013 Victoria Titles and a big thank you to all MRCCR members that helped out. Your memberships are all up for renewal. You can find the membership form in the document downloads section. Please see track hours on the hopmepage for racing over the easter/ANZAC break. Congratulations to Steven for winning both classes. 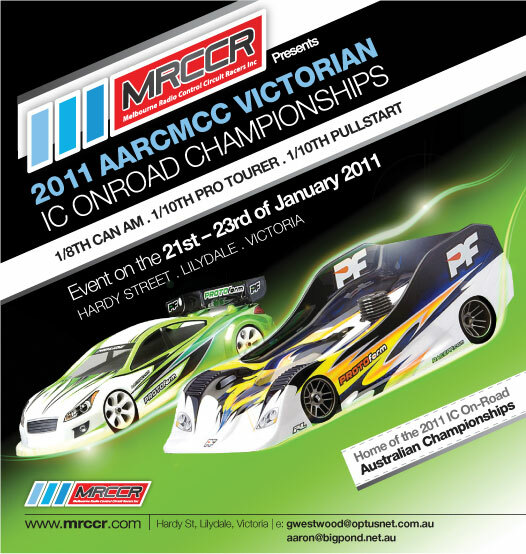 Firstly thank you to everyone that participated in the 2011 Victorian Titles and a big thank you to all MRCCR members that helped out over the weekend. The 2010 MRCCR Christmas Cup will be held on Sunday the 12/12/10. Entry will once again be $20.00 and include a BBQ lunch. Get there early, racing will be starting as early as possible.